Know what are health benefits and medicinal uses of Black Cumin Oil in Ayurveda. Learn some remedies of Black Cumin Oil to treat health problems. Black Cumin Oil is obtained from seeds of the Nigella Sativa plant. Nigella sativa plant belongs to family Ranunculaceae and is known as Black Cumin/black seed, Small Fennel (English), Upkunchikaa, Krishna jiraka (Sanskrit), Kalonji/Kalunji, Kala jeera (Hindi, common name), Kamaazaruus(Unani) and Karum seeragm (Siddha or Tamil). The seeds are black in colour and has stimulant, carminative, diuretic, lactiferous, emmenagogue (stimulate uterine contractions) activities. 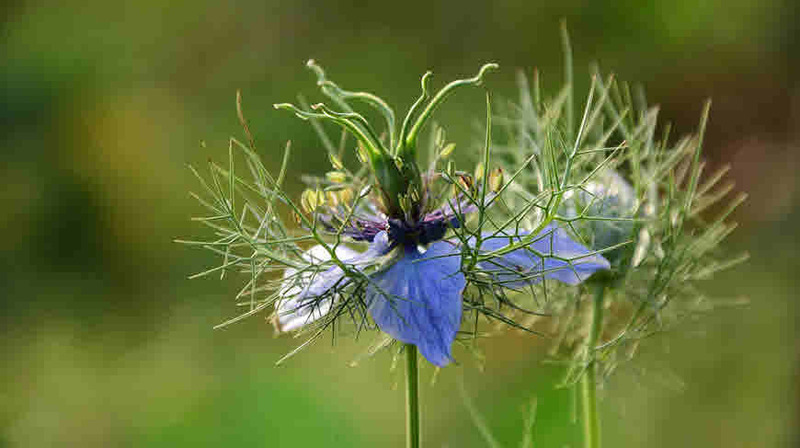 The oil obtained from the seeds of Nigella plant is used traditionally for cold, cough and bronchospasm. This oil can be used internally as well as externally. The oil of black cumin has hypoglycemic, anti-diabetic, anti-hypertensive, anti-inflammatory, antibacterial, anti-tumor and cardio protective activities. This oil can be used as an adjuvant along with the medicines. It is safe and compatible with any type of drugs. Nigella oil is effective in the treatment as well as prevention of diseases, but takes time to show the results. It should be used regularly for period of attest 2 months or even few months. Regularly take this oil in dosage of 25 drops, twice a day for a duration of three months. Take 2-3 teaspoon of black cumin oil. Apply externally on the affected areas. Do the same for a few months. Take internally 1/2 teaspoon of black cumin oil twice or thrice a day. Add 1 teaspoon of black cumin oil and honey in cup of warm milk. Drink before going to bed. Take 1 teaspoon of black cumin oil, once a day. Apply few drops on the affected areas. Massage cumin oil on temples. Apply topically the black cumin oil. This gives relief from itching and also has anti-inflammatory effect. Its application on wounds and cuts helps in quick healing. Mix jojoba oil (100 ml) and black cumin oil (20 drops). Use this for massaging.